Samsung Electronics plans to unveil a foldable smartphone later this year. September. 06, 2018 08:06. by Jae-Hee Kim jetti@donga.com. Samsung Electronics is planning to launch a foldable smartphone hits year. 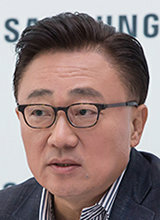 Koh Dong-jin, CEO of Samsung’s mobile division, told CNBC at the IFA 2018 electronics show Tuesday in Berlin that the development of a foldable smartphone is complicated but the company has nearly concluded it. Koh did not mention the exact date or location of a launch but Samsung’s foldable smartphone is likely to be unveiled at Samsung Developer Conference in November in San Francisco. "So every device, every feature, every innovation should have a meaningful message to our end customer. So when the end customer uses it, (they would think) 'wow, this is the reason Samsung made it'," said Koh. A foldable phone is a smartphone with bendable display that is expected to create new demands in the already saturated smartphone market. Huawei announced that it will unveil the world’s first foldable phone in November this year. Now the industry’s attention is on when Samsung Electronics will launch its foldable smartphone.